I just saw Bruce Springsteen’s Broadway show on Netflix… and now I’m a total fan of “the boss”. It’s an awesome performance based on his book, Born to Run. And if you’re interested in learning about “speaking from your essence,” I think you’ll want to check it out. Let me tell you what captivated my heart and soul. First, it was Springsteen’s authenticity. He was real as real can be. Of course, he’s been on thousands of stages. He’s performed his way into the hearts of audiences all around the world. But, this was not a concert. This was just one simple, humble man on just one, empty stage. He had two props… a piano and a guitar. The instruments, when played, were extensions of the stories he told. And these stories were about growing up in a small town, leaving that town, his alcoholic father, and his mother who has alzheimer’s and dances in the dark. He shared stories so personal, it made my heart bleed. He even shared the backstories behind his stand for justice and protests against the Vietnam war. And why, today, he continues to write and sing anthems that speak to the current political climate of division and hatred. Yes, he was born in the USA, and he has a lot to say about that fact. It was an over-the-top profound experience for me! One of the reasons is because, as a storyteller, Springsteen paints his life with words that let you dive deep into his humanity. From my experience as a speaking coach, being human is what an audience responds to most. They want to have that human touch. I think you’ll appreciate Springsteen’s show because he’s a model of what authentic presenting can be. I have to say, even I came away from the show with new lessons about what it means to be “authentic” on stage. 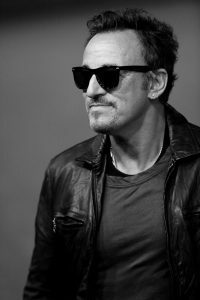 What were the three “Springsteen lessons” I took away? These are the same keys you can use to connect with and share more of your Essence when presenting. And if you want to compel and inspire your listeners when you speak? I’d love to help you. You can start by downloading my 7 Steps to Fearless Speaking. I’ll give you my tips on how to be more real when you speak… and if it feels like a good fit, we can work together to bring even more of your authentic self when speaking. Click here to download your free 7 Step Guide To Fearless Speaking.